Tonight The Voice returns with ‘The Quarterfinals.’ On last week’s show Team Blake and Team Christina put everything on the line to get America’s votes. On our last elimination show we lost Jesse Campbell, Jordis Unga, Erin Willitte and Raylynn. If you missed wither of the episodes you can read our full and detailed recap of the performance show here and the elimination show here. Tonight the remaining artists will sing and then Adam and Cee Lo must instantly decide who’s out. So the format of the show will have the same format as last week’s show; both Adam Levine and Cee Lo Green will have to eliminate someone from their team in the “instant elimination” round. So by the end of the show we will lose two more contestants. Cee-Lo Green hits the stage tonight in the world premiere performance of his new single, ‘Fight to Win.’ CeeLo takes the stage not once, but twice! 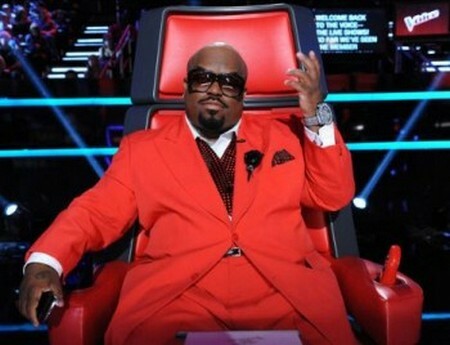 As previously announced, CeeLo will also perform alongside the artists on his team for the first time this season. Come back at 8p.m. when we will be blogging LIVE; you won’t want to miss what goes down. Tonight’s Recap: Carson Daly is asking why the coaches are all laughing… and Adam says: ‘something’s going on back there’ and Cee Lo pipes in: ‘I’m nervous I have gas’ and pulls out his portable fan… talk about appealing to the lowest common denominator. Adam brilliantly follows Christina’s ‘Follow your heart’ with ‘Just follow your fart.’ Good thing they get paid to make music not humor. Carson announces that tonight will they will have the reunion of Cee Lo’s debut group Goodie Mob with their brand new single – can’t wait. Team Cee Lo with Jamar Rogers singing “It’s My Life” by Bon Jovi – Amazing vocals – great job. Adam: says Jamar is amazing. Blake says this is best match of singer and song so far. Christina: says he sang hard –like it really mattered. Adam’s team with Katrina Parker singing ‘Jar of Hearts” by Christina Perri – Katrina sounds excellent. Blake asks Adman what he is going to do since it was a great performance. Christina says she did a fantastic job and should own who she is. Adam: says that Kat was not one of his favorites at the start but she has evolved. A bouncy fun performance – all good. She is simply a great singer – I am awestruck. Christina: she doesn’t like it… hmm? Adam thought the song was great but didn’t care for the props. James relies on his charm and good looks – it won’t work! Blake says the singing was good but dull – he is right. Christina was looking for more – something different. They are wearing grills… what can I say? Christina says let’s have a real Mickey Mouse club reunion. Adam is very proud and says it was refreshing. She is perfect simply a super talent. Christina says that she respects Cheesa for her courage – she loved it and says Team Cee Lo is where it is at! Pip screwed up big time – a bad job – he will be in trouble . Blake jokes about Pip’s bow tie. Adam tries to make it better than it was saying nothing’s perfect. Great song but not a great performance. Christina says she goes at it hard – she roars. Cee Lo is very pleased. Fair elims – Two singers are still in danger one form each team based on the votes. Come back tomorrow at 9PM EST for the eliminations and Florence + The Machine – and see Katy Perry’s new BF Robert Ackroyd maybe she’ll show up!! !